The East Coast Greenway is a 3,000-mile (4,800 km) biking and walking route linking the major cities of the Atlantic coast of the United States, from Calais, Maine, to Key West, Florida. The spine route and branching complementary routes are for non-motorized human transportation for everything from local commutes to long-distance trips. The nonprofit East Coast Greenway Alliance was created in 1991. The entire route has been selected. As of July 2017, 900 miles (1,450 km), or 32 percent of the route, is off-road on traffic-protected greenways. The vision is for the entire trail to be off-road. In 1991, a group of cyclists and long-distance trail enthusiasts met in New York City and formed a national non-profit organization, the East Coast Greenway Alliance (ECGA), to plan and promote a greenway linking existing and planned trails into a contiguous "spine route" between Atlantic coast cities. In summer 1992, the ECGA sent nine cyclists from Boston, New York City, Vermont, and Washington, D.C., on a 30-day "exploratory" cycle tour. In 1993, tours went along the route to explore options and promote the idea of the greenway. In 1994, the first promotional tour took place from Maine to Washington, D.C. "East Coast Greenway" became a trademark in 1995. The first five trail segments were designated in 1996. These segments were the Baltimore & Annapolis Trail in Maryland, the Charter Oak Greenway in Connecticut, the Coventry Greenway in Rhode Island, the Farmington Canal Greenway in Connecticut, and the Delaware & Raritan Canal Trail in New Jersey. These trails make up 56 miles (90 km) of the greenway. Between 1997 and 2000, about 150 miles (240 km) of trail segments were designated throughout the region. In 2000, Amtrak became a partner, helping to open access to various parts of the route. Between February and June 2000, the ECG Wave non-motorized relay carried a bottle of seawater from Key West to Canada along the route of the ECG. From 2001 to 2004, another 173 miles (278 km) were designated, and multiple states stepped in to help finalize their section of the route. This brought in more partnerships with government organizations, such as NJDOT, that would be essential for trail development. In 2003, members of the House of Representatives and the Senate signed letters to President Bush in support of the greenway. In 2004, seven cyclists rode the entire route, from Key West to Calais, in 55 days. Later that year, the first Maine-to-Florida tour was held; four cyclists completed the event in 52 days, raising $75,000. In the following years, more people would complete the ride outside of ECG events. A 2005 GQ magazine article about a ride by Wil Hylton brought national attention to the greenway. The entire spine route was finalized and mapped in 2008. The accessibility of the trail expanded with support of the states, and more events were held each year. As of 2017, 32 percent of the greenway is off-road. Efforts to increase the amount of off-road routes are continuing. Other cities may be connected by "alternate route" in some locations. More information about the route can be found online at greenway.org; an online mapping tool is available at map.greenway.org. Travelers start in Calais, Maine, at the Canada–US border, and pedal southwest through Ellsworth, where they can stay on the inland spine route through Bangor or veer off along a 150-mile (240 km) coastal route. The routes rejoin north of Portland, then head on towards Portsmouth, New Hampshire. The route through Maine is 350 miles (560 km) long, and 39% of that is currently off-road. Riders enter the state on the Memorial Bridge in Portsmouth, New Hampshire, and follow the coastline to Seabrook and then on to the Massachusetts border. New Hampshire has the shortest portion of the greenway: about 17 miles (27 km), all on-road. The greenway enters the state near Salisbury, Massachusetts, and heads south towards Boston and then to Waltham. Next, it travels on from Worcester to the Rhode Island border. The route travels along the Charles River and past the birthplace of the American Industrial Revolution. The greenway enters from Massachusetts on the Blackstone River Bikeway and follows the historic Blackstone Canal. It travels down to Pawtucket and then into Providence, where it goes around India Point Park at Narragansett Bay, and then on to Cranston. This 49-mile (79 km) section of greenway is 52% off-road, with another 30% being developed. Connecticut has the most rural stretch of trail in the region. It runs through historic mill towns, such as Willimantic, and major cities like Hartford, New Haven, Bridgeport, and Stamford. Users can travel on the Farmington Canal Greenway to get to New Haven from Simsbury and then ride along the Long Island Sound as they exit the state. Currently, 28% of the 198-mile (319 km) route is off-road, with an additional 28% in development. The New York segments starts in Westchester County and heads south into New York City through the Bronx and Manhattan. The route travels down sections of Broadway and along the Hudson River, which travelers can cross via the George Washington Bridge or by taking a NY Waterway ferry into New Jersey. New York is home to 44 miles (71 km) of greenway, with 62% of the route, the highest percentage on the greenway, being off-road. In Manhattan, 90% of the trail is off-road. Part of the New York City segment is concurrent with the Empire State Trail, which also goes up the west side of Manhattan but diverges from the East Coast Greenway in the Bronx, heading northward through the state instead of towards Connecticut. The New Jersey section of the greenway is accessed from New York across the Hudson River by the George Washington Bridge or ferry, and from Pennsylvania by the Calhoun Street Bridge across the Delaware River. The route travels through Jersey City, Newark, New Brunswick, and Trenton while also traveling through rural areas. New Jersey has the second-highest percentage of off-road trails at 54%. The greenway travels through the smaller towns of Bucks County, then through the city of Philadelphia, where it passes numerous historical landmarks and travels over Spring Garden Street, the city's most bicycle-friendly street. The route follows the Schuylkill River Trail south towards Delaware. The 67-mile (108 km) route is 31% off-road, but there is a third of the trail that has no route yet. Planning is being done to close the gaps. The greenway runs for 43 miles (69 km) through Delaware. Greenway users travel down the Northern Delaware Greenway to historic Wilmington and continue on to the Christina Riverwalk. Next, travelers head to historic New Castle and ride along the New Castle Riverfront before reaching Newark and heading west towards Maryland. One of the mile markers on the Torrey C. Brown Rail Trail, showing its designation as part of the East Coast Greenway. The route starts in Elkton, Maryland, and heads west to Perryville and the Susquehanna River. Travelers pass the Perry Point VA Medical Center and have great views of the Chesapeake Bay. They cross the Susquehanna at the Thomas J. Hatem Memorial Bridge, but they are limited to crossing between dawn and dusk on weekends, holidays, and special events that have been arranged in advance, and they must be at least 18 years old or have a valid driver's license. Havre de Grace is after the bridge, followed by Harford County, Monkton, and Cockeysville. Next, riders travel south through Baltimore and then on to Annapolis before finishing the 166-mile (267 km) stretch of greenway in Hyattsville and entering Washington, D.C. About 32 percent of the route is off-road. The trail splits in Bladensburg, Maryland, just before it reaches Washington, D.C. Travelers can follow the Metropolitan Branch Trail, which runs past Union Station; or the Anacostia Riverwalk Trail, which follows the Anacostia River past the Washington Navy Yard. The two trails rejoin at the National Mall, the ECG's official midpoint, then head for Virginia via the Arlington Memorial Bridge over the Potomac River. Just under half of the 8-mile (13 km) segment through the District is off-road; the downtown area offers no off-road option. Leaving Washington, D.C., travelers pick up the Mount Vernon Trail to Mount Vernon, head towards Fredericksburg on the Potomac Heritage Trail, and continue on to the state capital of Richmond. At this point, the greenway splits: the 300-mile (480 km) spine route (16% off-road) continues southwest to the Piedmont region of North Carolina. The alternate route, the 140-mile (230 km) Historic Coastal Route (46% off-road), travels southeast through Jamestown and Williamsburg, then towards Wilmington, North Carolina. The Greenway's spine route travels south through rural North Carolina into the Research Triangle Region, passing through Durham, Raleigh, and Cary. This section is on the American Tobacco Trail, which runs past the East Coast Greenway Alliance Headquarters in Durham. The route continues southwest through the Sandhills region and into Fayetteville before following the Cape Fear River into Wilmington and traveling along the coast. Alternatively, the Historic Coast Route, entering from southeastern Virginia, moves onto the Dismal Swamp Canal Trail and follows the coast down through Greenville and Jacksonville before reaching Wilmington where the routes connect. The 372-mile (599 km) spine route is 25% off-road at this time. The 270-mile (430 km) trail travels along South Carolina's coast through Myrtle Beach, Georgetown, Charleston, and Beaufort. The route is 15% off-road, with 20% more in development. Greenway riders in Georgia will use the Coastal Georgia Greenway to travel from South Carolina to Florida. The route travels through Savannah, Richmond Hill, Midway, Riceboro, Darien, Brunswick, Woodbine, Kingsland, and St. Marys. The 160-mile (260 km) route is only 6% off-road but has another 14% in development. There are 41 miles (66 km) of gaps, but efforts are being made to connect the route. The Florida section of the ECG starts in Fernandina Beach and travels south along the coast through small beach towns and major cities, such as Jacksonville and Miami. The route continues down through islands and bridges to the southernmost point of the continental United States, Key West. This segment of greenway is 600 miles (970 km) long, the longest of the ECG, and is 31% off-road. There is another 13% in development and another 38% in public control and is to be developed. There are some gaps. 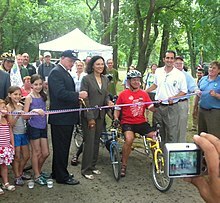 Jerramiah Healy, Mayor of Jersey City, cuts ribbon for a bikeway to Newark. The East Coast Greenway Alliance (ECGA) is a nonprofit organization that oversees, but does not own, the greenway. The Alliance is based in Durham, North Carolina, next to the American Tobacco Trail. Six Greenway coordinators work remotely in their regions. The Alliance coordinates the Greenway's growth by working with local, state, regional, and national organizations and agencies. The Alliance is in charge of designating new trail segments and finding routes for the greenway, posting signs designating the path, spreading awareness of the project, and providing maps and information about the greenway. ECGA advocates for safe access to bike paths on roadways and bridges, as well as convenient access to public transportation for cyclists. In addition, the Alliance promotes the use of alternate transportation, such as use of greenways. ^ Markatos-Soriano, Dennis. "East Coast Greenway E-News". Greenway.org. Retrieved 30 December 2014. ^ "East Coast Greenway » History of the ECG". www.greenway.org. Retrieved 2016-06-08. ^ "East Coast Greenway » Designated Trail List". www.greenway.org. Retrieved 2016-06-06. ^ "East Coast Greenway » Maine". www.greenway.org. Retrieved 2016-06-09. ^ "East Coast Greenway » New Hampshire". www.greenway.org. Retrieved 2016-06-09. ^ "East Coast Greenway » Rhode Island". www.greenway.org. Retrieved 2016-06-09. ^ "East Coast Greenway » Connecticut". www.greenway.org. Retrieved 2016-06-09. ^ "New bike, walking trail would link N.J.'s 2 largest cities". Retrieved 27 March 2017. ^ Anderson, David (August 24, 2016). "Hatem Bridge bike riders will be limited to weekends, holidays starting Sept. 6". The Aegis. Baltimore Sun Media Group. Retrieved September 18, 2016. ^ "East Coast Greenway » Maryland". www.greenway.org. East Coast Greenway Alliance. Retrieved June 14, 2017. ^ "Washington, D.C." Explore By State. East Coast Greenway. Archived from the original on November 18, 2015. Retrieved June 15, 2016. ^ "East Coast Greenway » Virginia". www.greenway.org. Retrieved 2016-06-13. ^ "East Coast Greenway » North Carolina". www.greenway.org. Retrieved 2016-06-13. ^ "East Coast Greenway » South Carolina". www.greenway.org. Retrieved 2016-06-13. ^ "155 Mile Trail System ~ Coastal Georgia". coastalgeorgiagreenway.org. Retrieved 2016-06-13. ^ "East Coast Greenway » Georgia". www.greenway.org. Retrieved 2016-06-13. ^ "East Coast Greenway » Florida". www.greenway.org. Retrieved 2016-06-13. ^ "GoSmart". www.gosmartnc.org. Retrieved 2016-06-08. ^ "Ten innovative nonprofits receive $40,000 GSK IMPACT Awards for contributing to a healthier Triangle region | GSK". us.gsk.com. Retrieved 2016-06-08. ^ "Award Database". League of American Bicyclists. Retrieved 2016-06-08. This page was last edited on 25 April 2019, at 03:33 (UTC).